Up until recently Nicole's just been in sleepsuits because it's just easy to change in and out of for when I work from home but recently with the heat wave we started wearing leggings and top more. She's 7 months but slowly growing out of 6-9 months already so I decided to pick up some 9-12 month clothes for a quick wardrobe update for her. Two t-shirts and a pair of joggers from Rockin Baby they currently have a sale on so it's worth having a browse to see what's on offer. Every piece of clothing sold from their S/S16 collection an item from their Rockin Baby Hero Collection will be gifted to a child in need from 30 countries. Their aim is to reach out to millions of children across the world and donating clothes to those less fortunate. 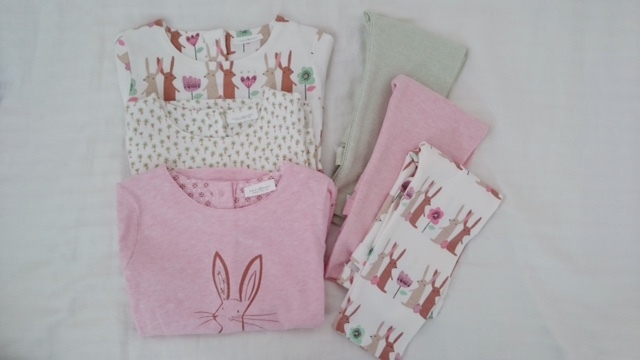 Next baby range from their new Blossom baby girl collection. 3 top set for £13 and 3 legging set for £9 so you can mix and match the outfit. Lastly she's finally fitted into her super cute baby Converse which seems to go with every outfit. I think we will be picking up another pair when she grows out of this one. Another Sophie La Giraffe teether since we have taken one for my aunts house and it saves us moving things around each week. I absolutely love buying outfits for Nicole but I just can't justify splurging all the time since she grows out of things so quickly!!! !